Who Are the Ideologues Now? 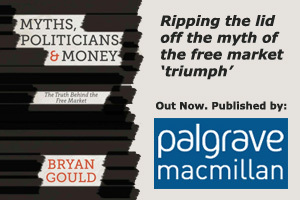 It is a truism of today’s political analysis that, over the three or four decades since the onset of the so-called “free-market” revolution that swept across the western world, the centre of political gravity has moved substantially rightwards. Most of those of middle age or younger will have grown up, after all, in a world where it has been widely accepted that markets are more or less infallible, that government spending is inevitably wasteful and a drag on economic development, that running a country is just like running a business, that we all benefit if the rich get richer, and that private profit justifiably and inevitably overrides all other considerations. So insidious and comprehensive has been the advance of this orthodoxy that even those who choose to question or oppose it are hard put to understand how complete and extensive has been its victory. Political leaders who seek to offer alternatives are disarmed and enfeebled, without realising it, by their experience of growing up within its confines. They are, in any case, urged – on electoral grounds and even by their friends – to understand and accept the new reality; and that reality, of course, keeps on moving rightwards. One of the most significant consequences of this re-definition of the political landscape has been the acceptance that what would once have been regarded as at the extreme outer edge of what is politically possible is now the new centre ground. Any divergence from this central position is, by definition therefore, literally eccentric; and any move away from “free-market” orthodoxy is condemned as either a return to the past or an irrational lurch leftwards. These definitions of centrality and divergence have had the further advantage, for their proponents, of confirming a long-held public perception. In the days when the political left was prepared to challenge existing power structures, they were undoubtedly helped by their development of, and adherence, to an ideology of sorts that allowed them to ground their objections to orthodox policies in some loosely defined analytical framework. It was perfectly understandable that, as a consequence, the left in politics was seen as the doctrinaire element in the political spectrum, whereas the right was identified as pragmatic and concerned with what would work. Indeed, it is the fear of being characterised as ideologically driven that inhibits today’s leaders of the left from straying too far from current orthodoxy. Parties of the right have found it advantageous, on the other hand, to clothe their lurches rightwards in the language of experiment and exploration of what is possible, rather than of ideology. They have also proceeded stealthily, one small step at a time, with the intention of concealing from the public that each new step is in reality a further development of a highly ideological agenda. That may, however, be about to change. As the tide of ‘free-market” orthodoxy has reached its high-water mark and appears to be receding (at least in most parts of the western world other than the euro zone), it is more and more likely to leave exposed to public view those new policy initiatives that seem to have little to do with common sense and practicality and to reflect much more clearly what are doctrinaire preoccupations. Consider the following recent instances. The government’s ideological preference for private over public provision has led them to engage Serco – an international firm already notorious for its failures in a range of countries – to run some of our prisons. The outcome? The shambles – and the unacceptable and damaging shambles at that – now revealed at Mt Eden prison. Charter schools? An idea that has already been shown in its country of origin, Sweden, to produce disastrous results in terms of educational standards, and is now in the process of proving that point all over again in New Zealand, at the expense of some of our most needy and disadvantaged children. And what about the wacky idea of financing the delivery of social services to some of our most vulnerable citizens, including the mentally ill, by selling bonds to private investors who will then expect to make a profit from their “investment”? What links all of these and other similar ideas is that they have little to do with what will work and best serve the interests of society and its citizens. They are instead all statements of ideologically driven preference – in each case, a preference for private provision, not because it works better, but because it is a faithful rendition of “free-market” theory. It seems, in other words, that the usual view of the left as doctrinaire and the right as pragmatic is in course of changing. It is now the right that espouses the ideological approach and that will go on doing so for as long as it is not held to account and its bluff is not called. It is the left (when it can make up its mind and, like the lion in the Wizard of Oz, reclaim its courage) that has the opportunity to offer new alternatives to free-market orthodoxy that are not the product of doctrine, but are simply sensible and will produce better outcomes. Next: Are “Realistic” Labour Leaders Best Placed to Win An Election? I am reading this during a holiday in Toronto, staying with people I like but who are so blindly right wing in all their views that as a matter of common politeness I have to exclude myself from the conversations going on around me. In the last few minutes I have heard that Iraqis should be bombed into oblivion and the oil assets handed over to BP and Shell; that drug addicts and other socially undesirable folk should be left to their own devices; that aid to the poor, diseased and hopeless of Africa is a waste of money; and that the Greeks are by nature indigent and should be left to stew in their own juices.